I read this based on the comparisons to Sarah Dessen and while I don’t think it’s quite accurate yet, I can definitely see Kirby growing and reaching the same skill level while maintaining her own voice. Thanks for stopping by, though–glad to see you’re back! It’s been a while! =D Im back to blogging after many, many exams and University project sniff!! I love when bloggers review books that came out a while ago. This one sounds like a good contemporary read. Great review my sweet! Such a lovely review, Reynje! Your comparing this to Dessen and Ockler definitely makes me want to check this one out; I’ve enjoyed all the Dessens I’ve read so far, even the ones that have been more middling reads for me. Thanks for the lovely comments everyone! For anyone thinking of giving Moonglass a try – enjoy and happy reading! Great review! This book made me cry! I love books that deal with real emotion of the characters heartbreak. I have this book sitting on my shelf, but haven’t had a chance to read it yet. Your review makes me more interested to read it. I do like character driven stories with some depth so will have to give this one a try. Reynje, what an AWESOME review! 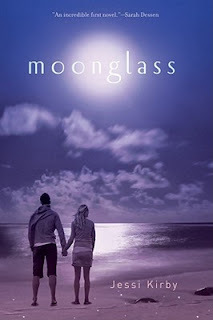 ♥ I am dying to read Moonglass since I heard really great things about Jessi Kirby’s debut novel and your review completely convinced me to read it! I really liked this one too, Reynje. The writing was slow paced but very beautiful and moving. Count me in! I love Sarah Dessen and Moonglass sounds like something I’d like to read. Great review, Reynje! great review! I just got this book in the mail and I’m rather excited to read it, even after your review. It just seems like a book written for me. Thanks Ashelynn – looking forward to hearing what you think of this one. Hope you enjoy! The cover is lovely, roro – its really shimmery and pretty. Happy reading! I really enjoy getting to now the characters well. I’m not too big on contemporary though, so I tend to be very picky with the ones I choose to read. This one is on my TBR list though. Thanks for the lovely review!! I am completely and totally a character person moreso than a plot or romance person, so I just LOVED Moonglass and I am glad to see you liked it as well. I think what I appreciated the most was that the book was never overwhelmed by romance and the love interest, Tyler, didn’t fix all of her problems. Totally agree April – I love that the romance didn’t take over the story. Glad you liked this one too! A friend, who loved Moonglass, recently sent it to me. We almost always agree on books, so I have high hopes. I love a great character-driven plot. I’m glad you were able to enjoy the book. Great review! Thanks Sam :) If you like contemporary YA, this one is definitely worth checking out.